The latest feature to be added to Thexyz Webmail was requested via our product feedback forums and is now available for all users. Mailbox rename will allow email administrators to rename a mailbox and retain all data. In the past the only way to achieve this was through an email migration. 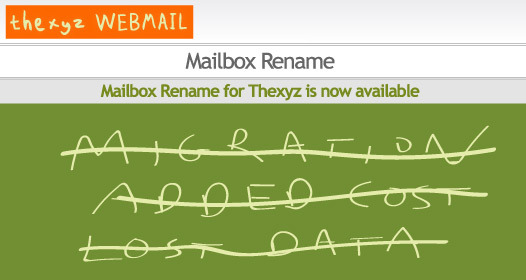 To rename a ma‎ilbox you can login to the email administrators control panel or submit a ticket with your request. The user must update their username in their email clients and mobile devices to maintain access to the account. Rename does not support SharePoint, any associated SharePoint user will not be renamed. Chat buddy lists are not automatically updated during a rename. Users will need to re-add buddies.